Just one day remains before I receive some well-deserved time off. There are any number of ways to celebrate breaking the chains of societal demands and I'm sure I'll imbibe in all of them -- food, booze, babes (well, one babe) -- in the week to come. 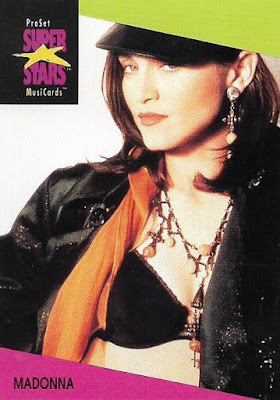 Recently, I received a sizable chunk of the 1991 Pro Set SuperStars MusiCards series from The Writer's Journey. 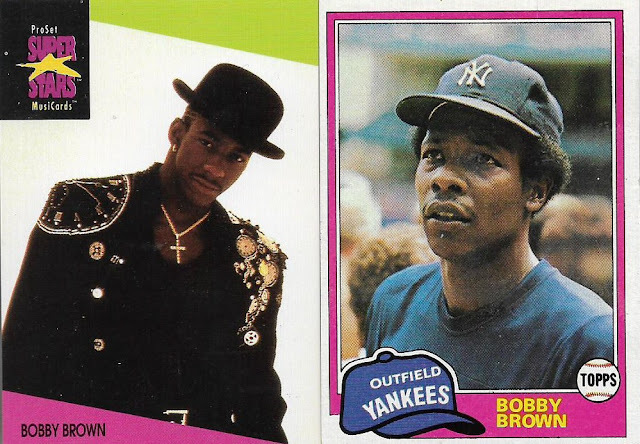 I've made no secret of my love for music trading cards -- I wish there were more of them, there should be more of them (and if there were more of them this would be a baseball blog no more) -- and lately have been focusing more on finding them. One of the easiest sets to find is the 1991 Pro Set ... uh, set (stupid Pro Set and its stupid name). And it is my goal to complete it fairly quickly. 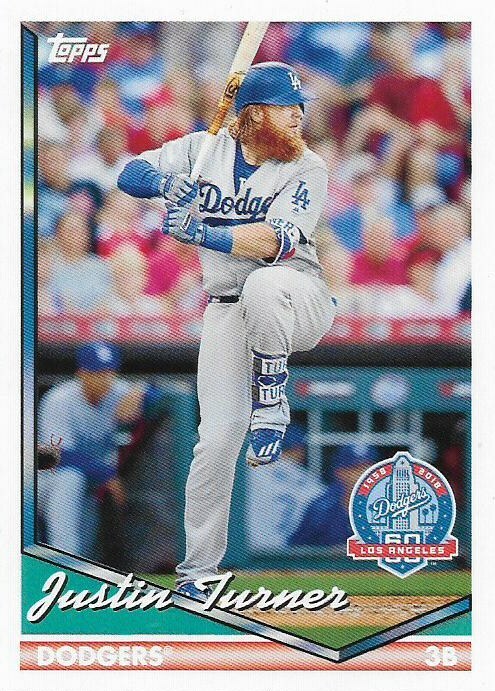 I will be posting a want list just as soon I can figure out what I received from J.T. here. 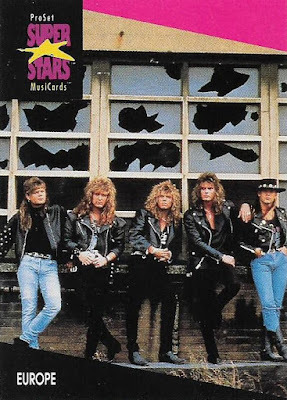 I bought a number of MusiCards ... uh, cards (sheesh) in 1991 because it was 1991. 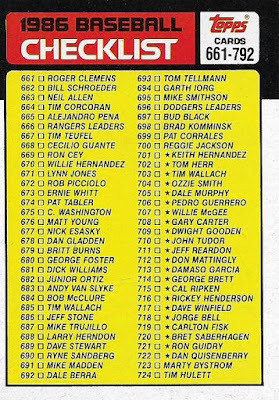 That's what people did in 1991: buy cards. The local drug store shelves were like nothing you see today. They were filled with card product. 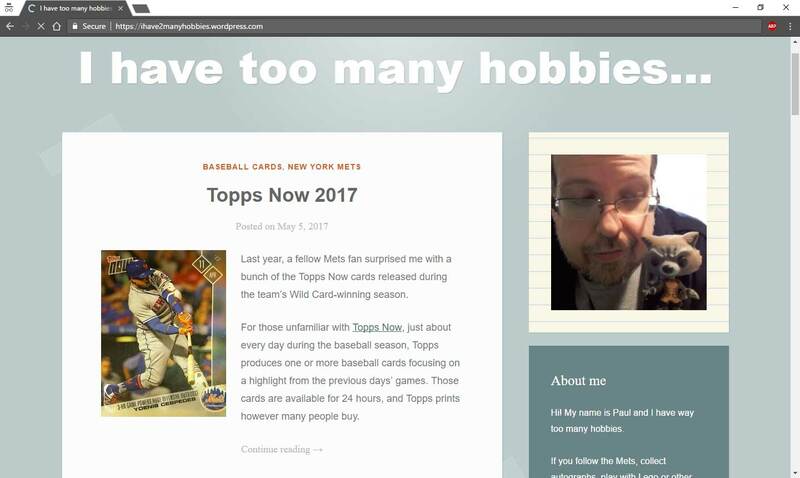 Topps, Donruss, Fleer, Score, Upper Deck, Bowman and Pro Set's many dabblings in several areas of entertainment, NFL, NHL and nonsports. I liked the look of the MusiCards and I especially liked the selection. Pro Set really tried to cover the spectrum of the music scene. 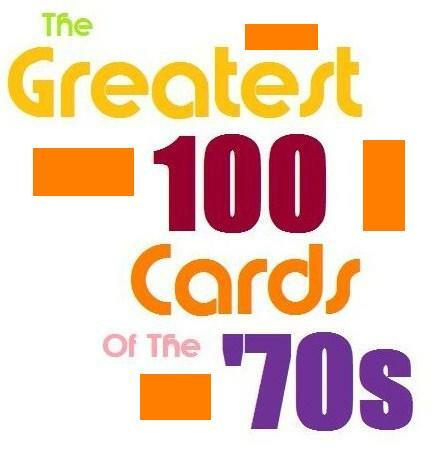 The set of 340 cards is broken up into Legends, Pop, R&B/Rap, Rock and some old-school psychedelic posters. The design is color-coded, too, with gold for legends, light green and pink for pop (yes, this is the early '90s), green and purple for R&B and pink and black for rock. 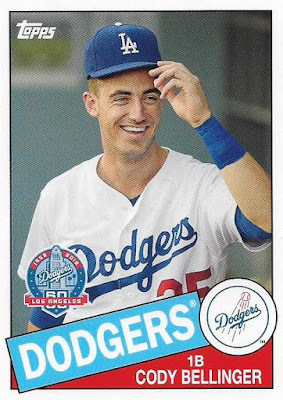 I've already gone on far too much for a set that is almost as ubiquitous as 1991 Donruss, but, man, music is more of my life than baseball, so you'll have to suffer through this. Let's start with the beginning and a Legends card. The legends are who you would expect: Led Zeppelin, the Doors, Jimi Hendrix, the Allman Brothers, etc. 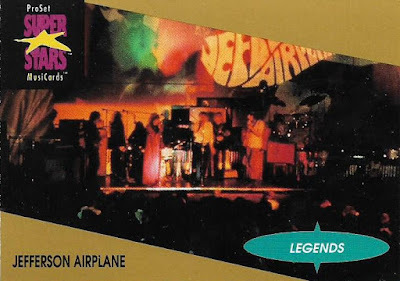 My selection of Jefferson Airplane is related to my fascination with the band. Due to many changes in the band lineup (and many band name changes), it went from "White Rabbit" to "We Built This City" with a stop over at "Count On Me". Listening to the queen of '60s psychedelia, Grace Slick, sing "Nothing's Gonna Stop Us Now" from the Mannequin soundtrack will never stop blowing my mind. The weird thing is, I like it all. (P.S. : "Winds of Change" is awesome and very '80s). Part of me wishes the set wasn't numbered by genre, as musicians really dislike categorization, but that could be a little jarring to view. 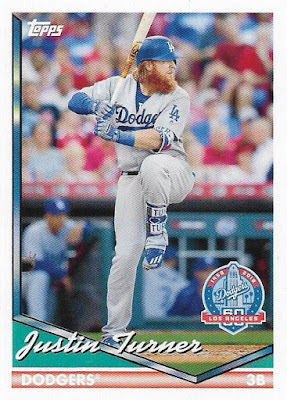 You get a bit of an idea when the card numbers turn over from Legends to Pop. Card No. 25 is Led Zeppelin. Card No. 26 is Paula Abdul. Because it's 1991, the set is heavy on who was popular in 1991. Paula Abdul, head over heels for MC Skat Kat at this time, appears on multiple cards. So does Debbie Gibson (I still can't figure out how she got on the radio). So does Madonna. And Janet Jackson. This is a definite disadvantage of the set. 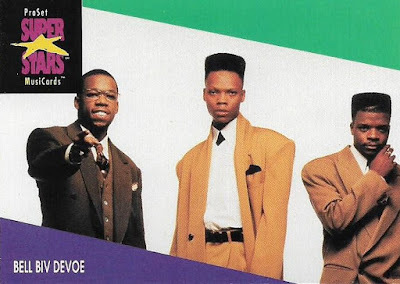 But with such a wide-range of musical acts, I'm willing to take the good with the bad and I'm having a great time going through some of the groups and singers forgotten by the public at large but not by me. When The Cult's first single -- "She Sells Sanctuary" -- popped up on radio or video (I don't remember which), in 1985, I became obsessed with owning it. I was still making the transition to CDs at the time, so I bought the 45, placed it on my phonograph and wore it out. I'm convinced that if you go back to where I was living at the time and walk into where my bedroom was, you will hear "and the world, and the world drags me down" over and over. 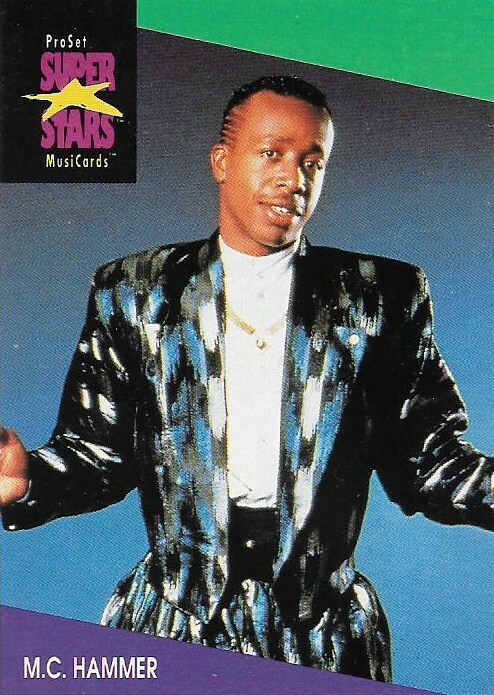 I am a fan of the freestyle music craze of the late 1980s. 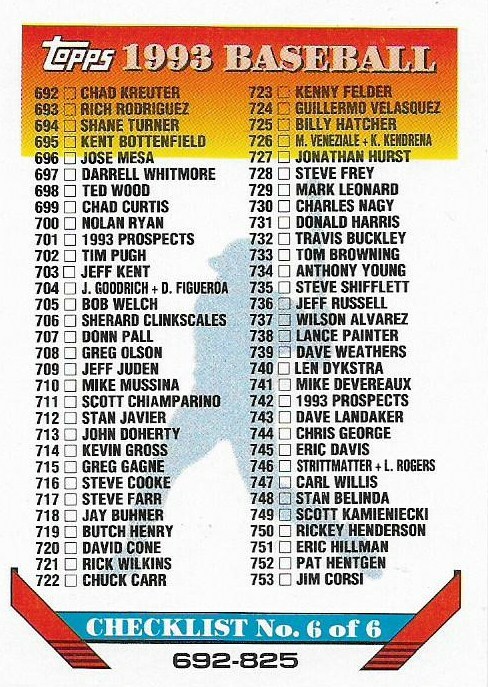 I'm a bit disappointed not to see Miami Sound Machine or Lisa Lisa or Expose or Company B in this set (although I don't have the checklist memorized). 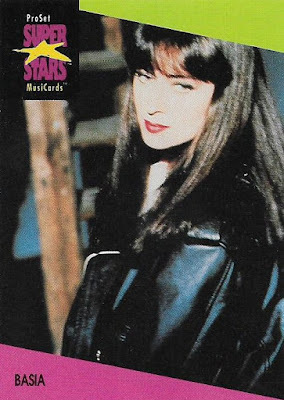 Basia sang on several latin-flavored hits, although most know just "Time and Tide". I still play her songs on the regular today. Tremendous voice. Alannah Myles is in this set because of "Black Velvet," and is known as a one-hit wonder in the U.S., although she generated a few more hits in her native Canada. 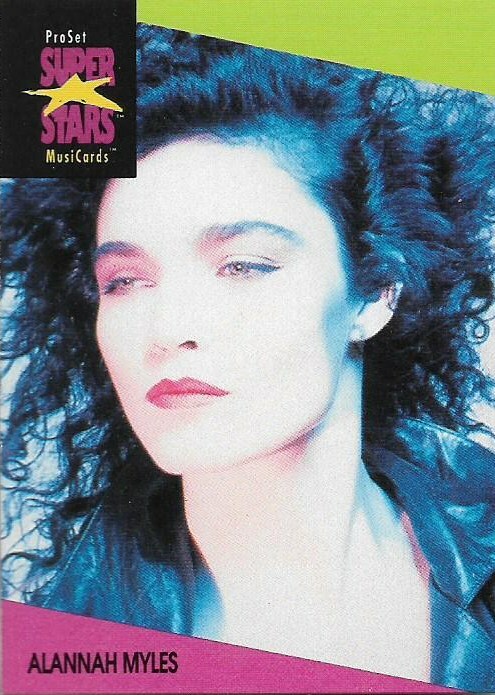 Another tremendous singer who was victimized a bit by formulaic recording, but "Rockinghorse" still kills. For me, the set is a little bit thin on alternative acts, which is too bad because that's where my musical interests resided from the late 1980s into the '90s. Nothing from the Cure, Love and Rockets, Tears for Fears or New Order. Too bad. 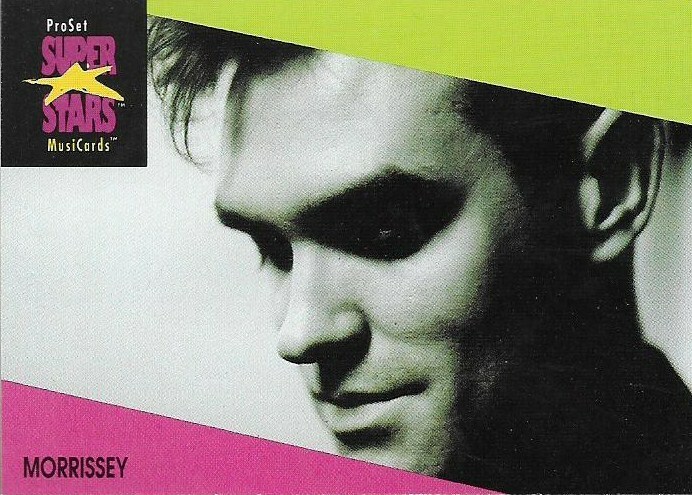 Morrissey helps a bit. 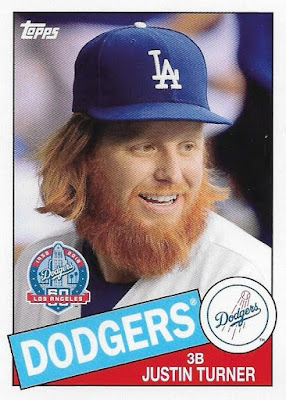 There is also a Sonic Youth card. I tried to get into them. 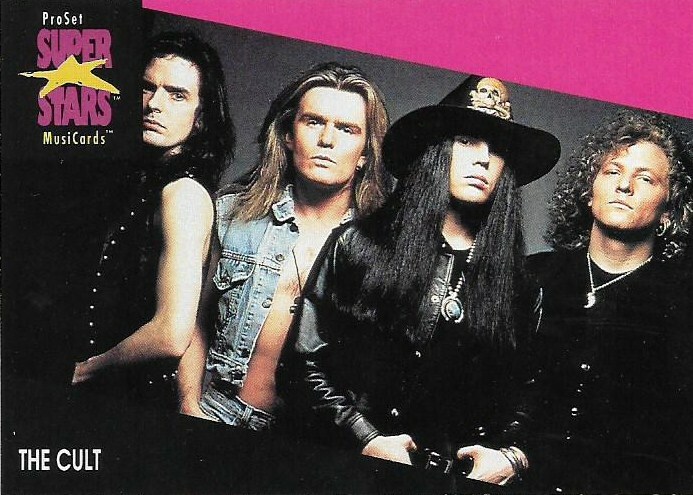 Bought one of their albums during my '93 alternative phase. Just couldn't handle it -- after many listenings it was just too much noise -- and went back to the Smashing Pumpkins and the like. Kind of all over the board there. 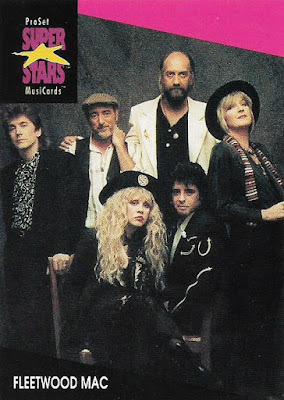 A Buckingham-less Fleetwood Mac. A bespectacled Idol. For me, Soundgarden is the undisputed king of the grunge era. 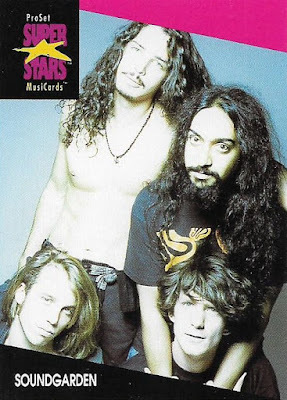 Nobody did it better than Chris Cornell. Then you plummet all the way down to Europe. 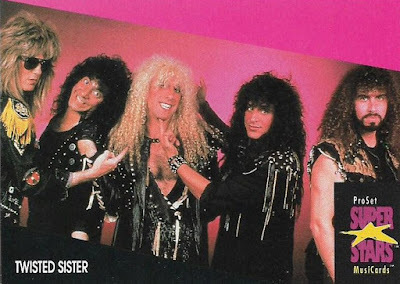 You may be sick of "The Final Countdown" and I understand completely, but every time I hear that song, that's three minutes-and-whatever that I'm not hearing that other song, possibly the worst thing ever: "Carrie". If I was a girl named Carrie, I'd change my name instantly for fear some guy would come at me with that song. Too absolute legends. 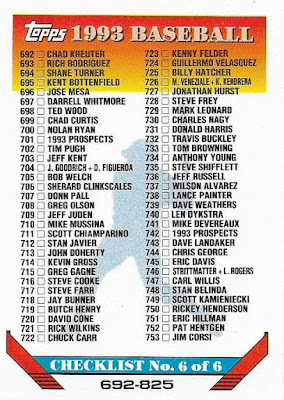 The Legends cards, for the most part, cover a period before my time. I was a little kid when Hendrix and Page were doing their thing. 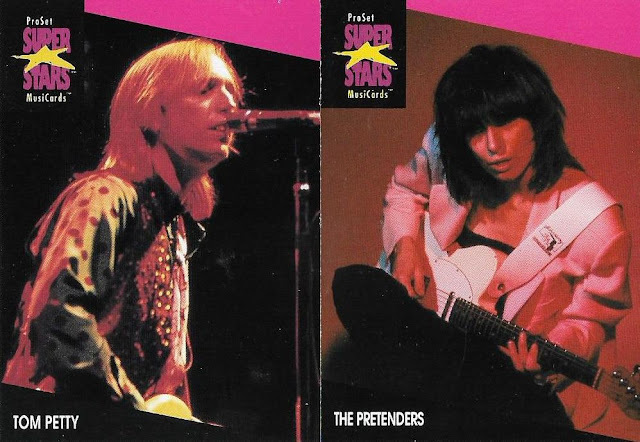 My legends are people like Petty and Chrissie Hynde. These cards need some gold on them. This is why I like this set, why I like music trading cards in general. 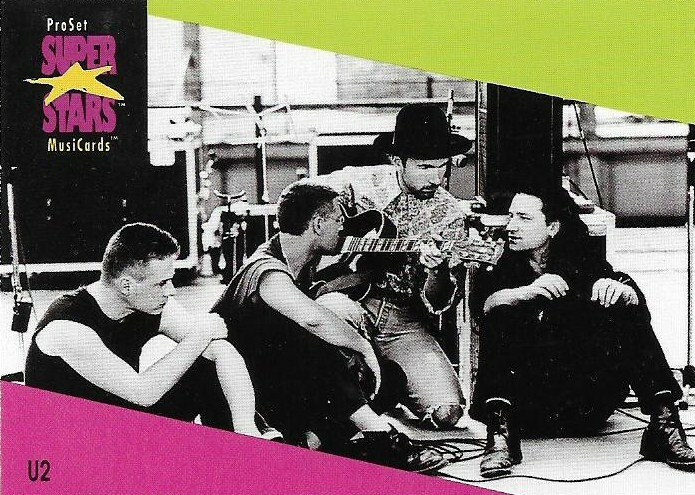 How cool is it to have a card of U2? 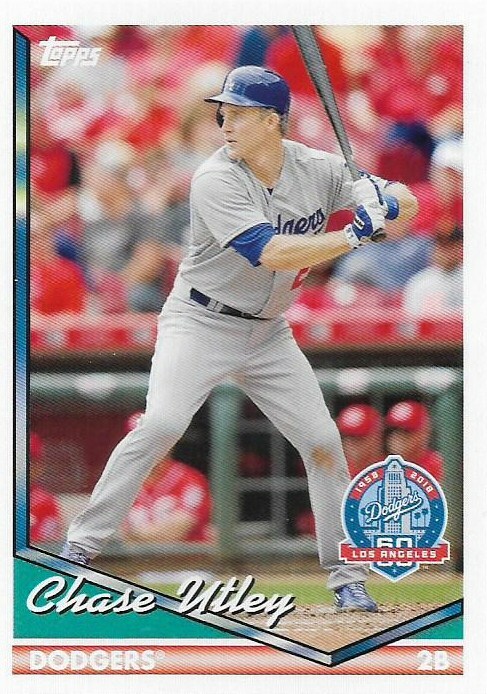 I don't get that feeling when I pull a card of Mike Trout. I don't. U2 and many musicians are on a whole other level. The rock portion of the set gets weighed down with too many hair bands, most of which I had no idea existed. (Trouble, Lord Tracy, Vio-lence). You see all that "who?" 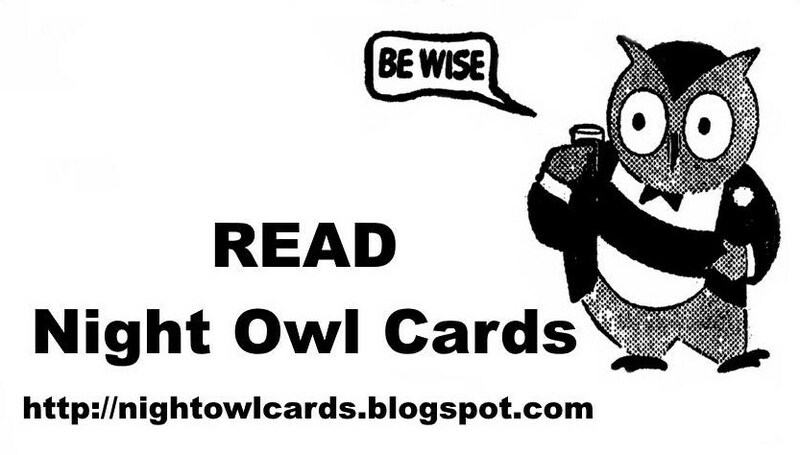 and you get a bit miffed there's no card of Heart or Rush. If I were you, I'd take pre-caushuuuuuuuunnns. 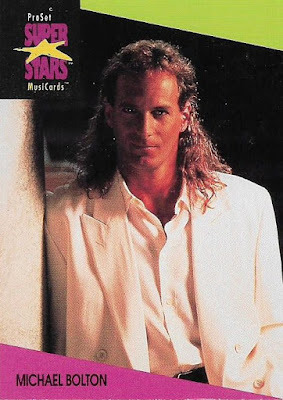 (Also, thank goodness there's only one Richard Marx card). 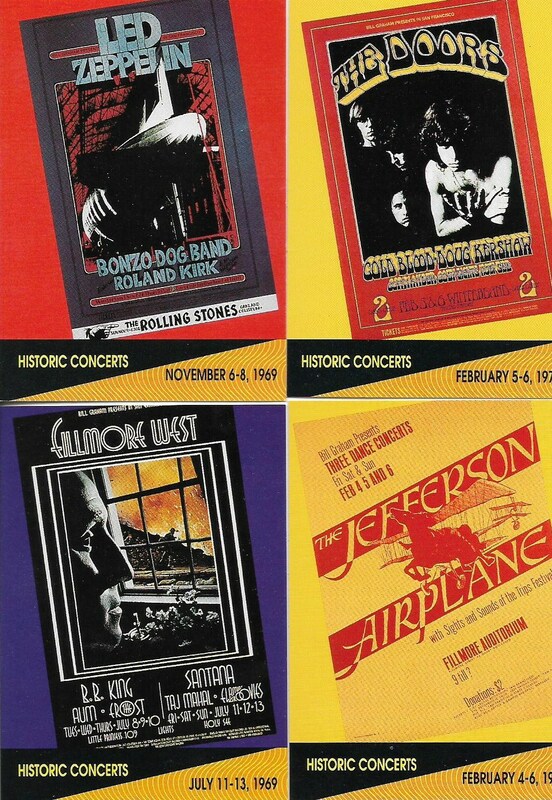 Here are four examples of the concert posters (I mis-cropped the right side). 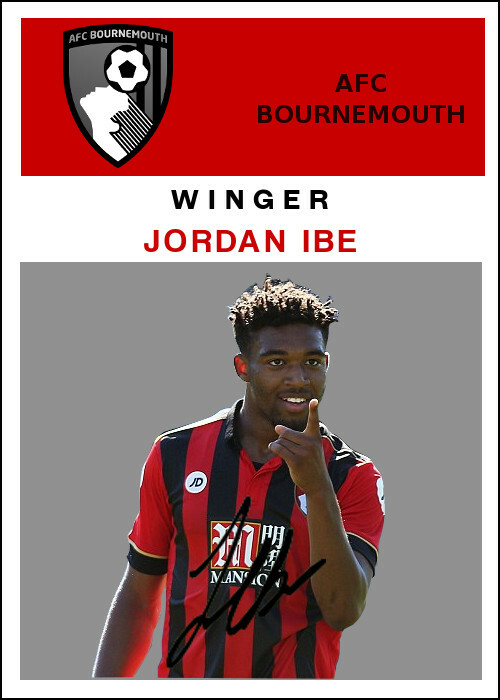 The fonts used for the posters are virtually unreadable but I selected four that you can make out. Going through these cards has been a great time and I'm not sorry to say it's a much better time than going through the latest baseball card sets on the shelves, even something like Stadium Club (which may be at my nearest big box stores right now, but I have no inclination whatsoever). 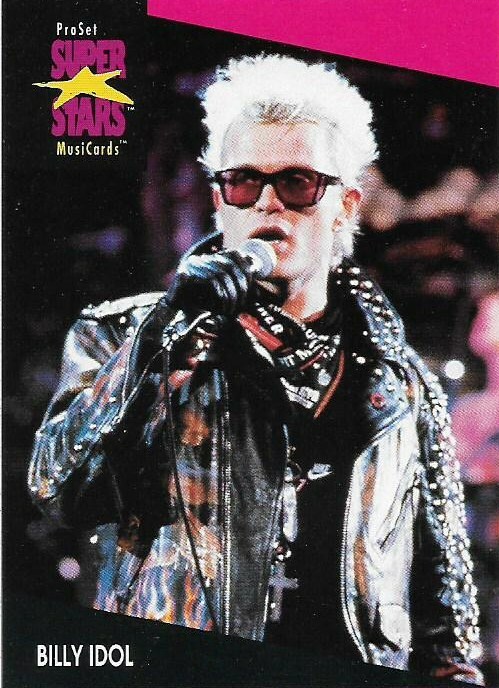 The Pro Set MusiCards also produced a set in the United Kingdom in 1991. The set is smaller, but features lots of notable artists who aren't in the U.S. set (the Beatles, Bruce Springsteen, Michael Jackson, Elton John, Annie Lennox, for example). 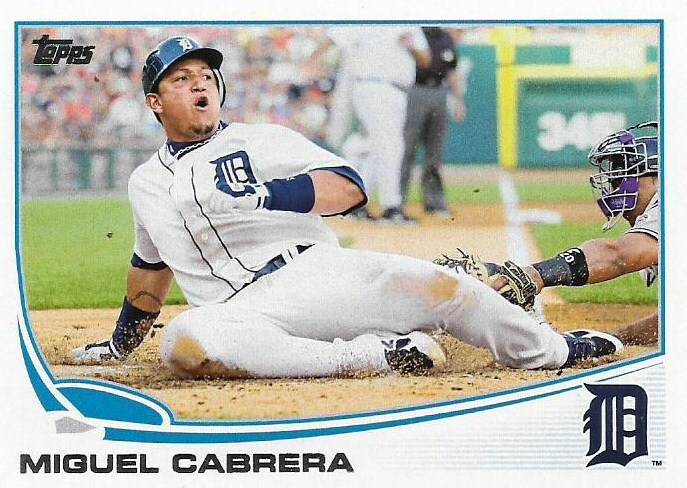 I've already got my eyes on a box of UKs because I want all of the cards that are offered. 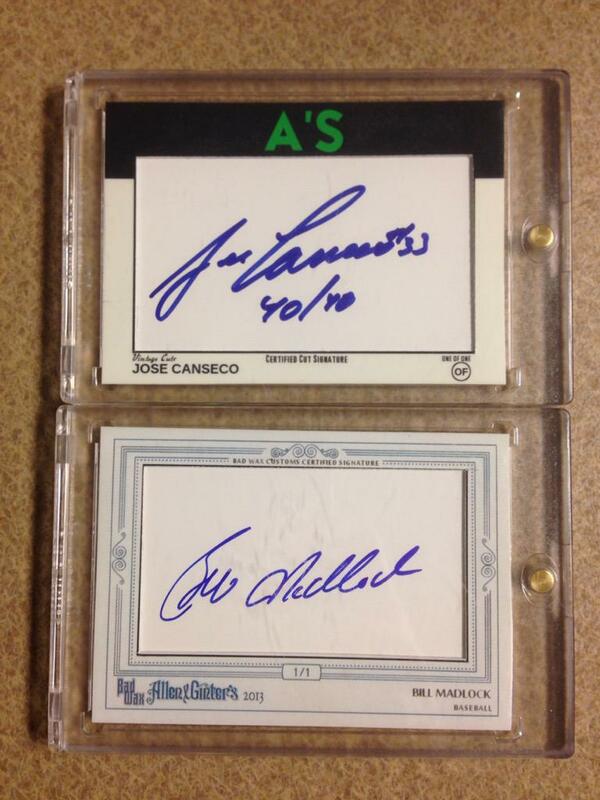 So if you have any extra of these lying around and they're on my want list, let me know. Everybody's talking all this stuff about me, why don't they just let me live. 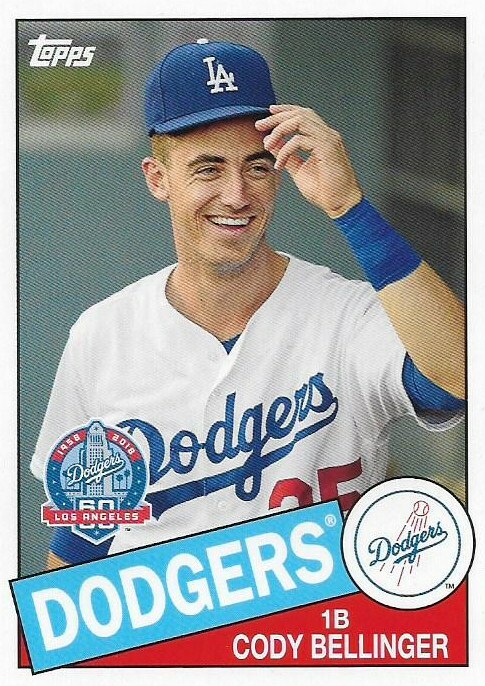 I find it a little amusing that I am one of the few people blogging about the Dodgers' 60th anniversary baseball card giveaway, given that I am nowhere near the site where they're giving away the cards. 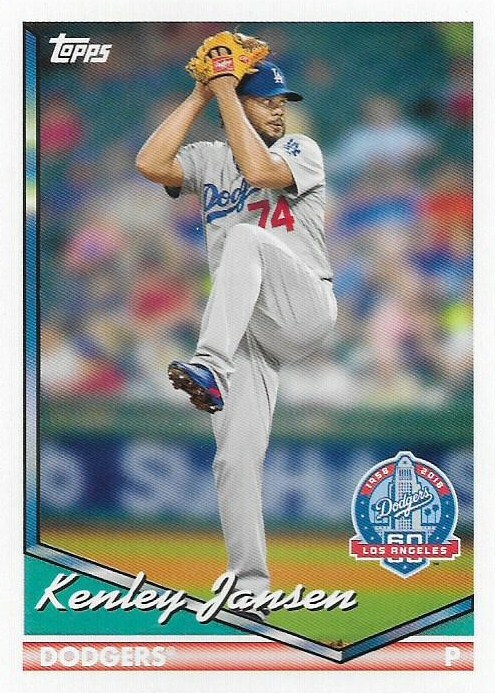 Dodgers Blue Heaven has provided the usual complete rundown on the cards, and I've seen them on gcrl's cards as I see them blog. 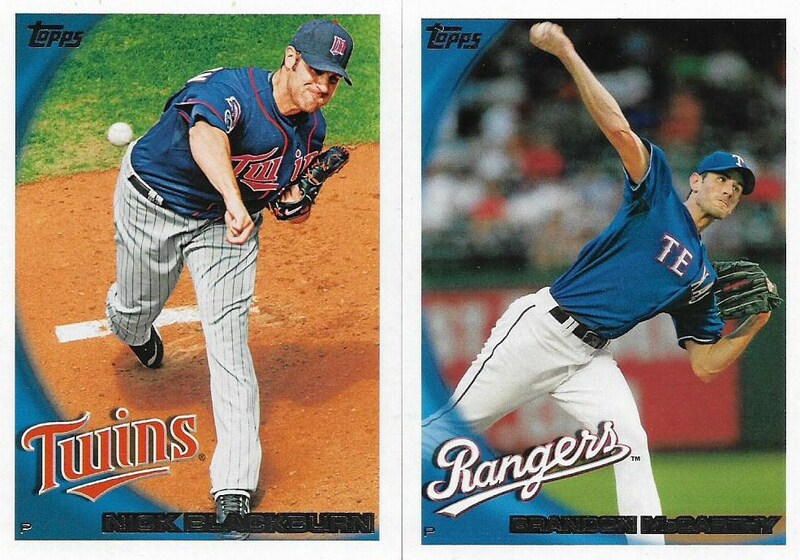 And, of course, they've appeared on the blog Stadium Fantasium, written by my source for these cards, Andy. 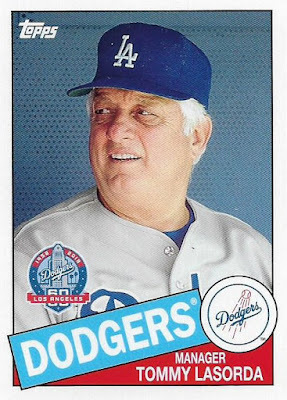 He provided me with the first two series in the giveaway, which celebrated Dodgers teams of the 1960s and 1970s, with the 1965 and 1977 Topps designs, respectively. 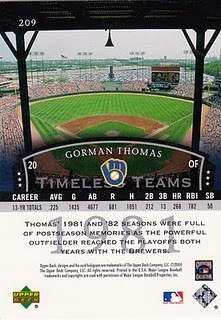 Recently, he sent the next two giveaway packs to me, which focus on the 1980s and 1990s. Let's see those. 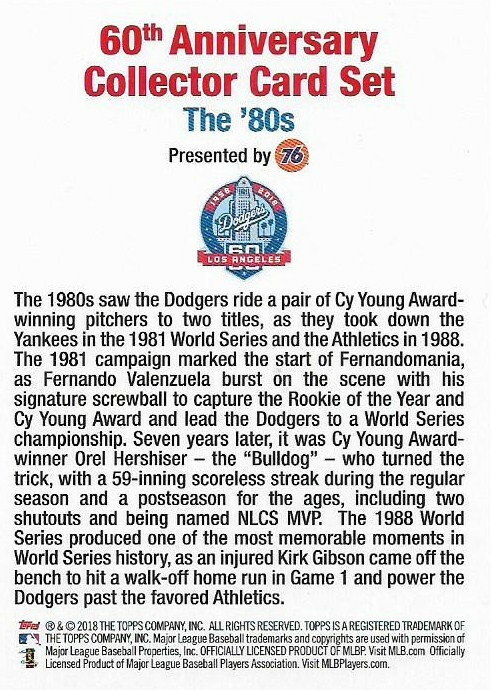 The 1980s really is the end of a golden age in Dodgers history, which began in the 1940s and ended when the 1990s started. 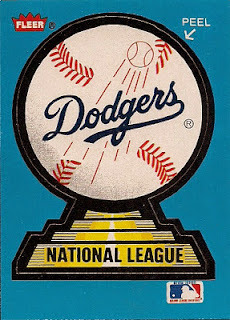 During that period, they reached the postseason 18 times and won the World Series five times. It hasn't been the same since. 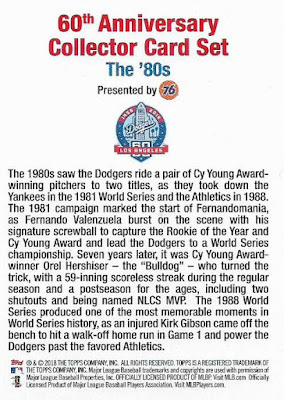 The '80s write-up focuses on the two World Series teams, from 1981 and 1988, but the design is from 1985. I sure do miss candid photos. 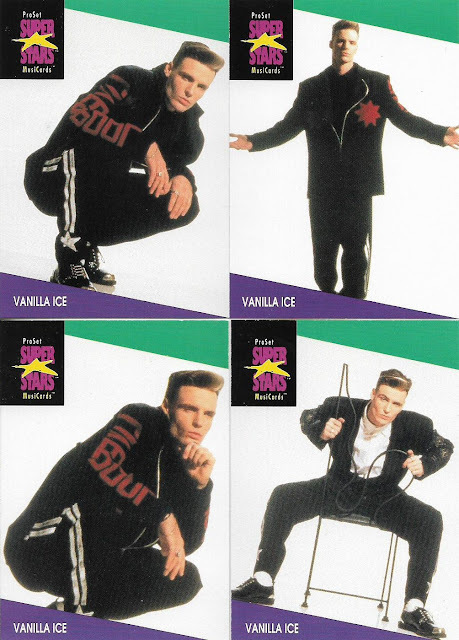 The set features a mix of candids, posed and action, just as you saw in 1985. 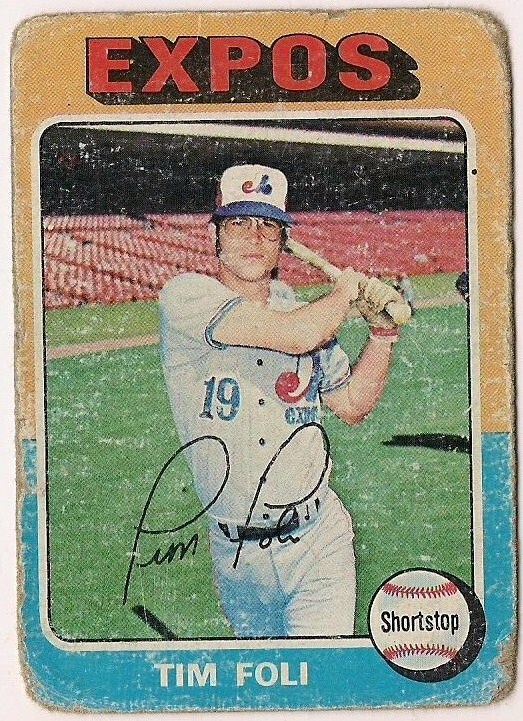 The current players shown are the same ones in the '60s and '70s sets (and the same in the '90s, too). The one throwback person from the '80s is not a player. 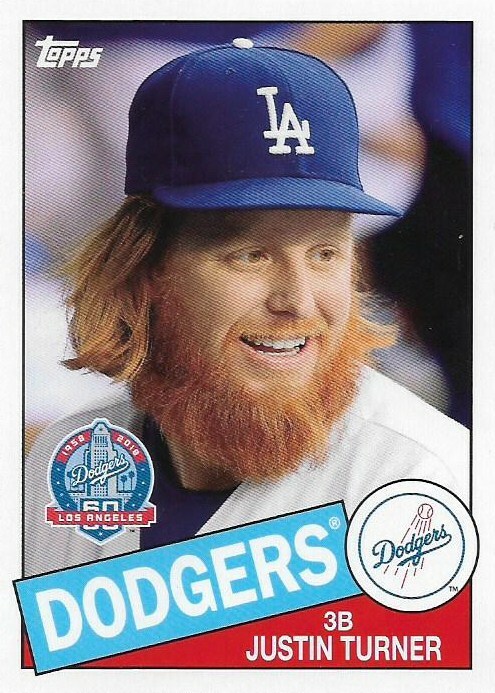 I was kind of hoping for Fernando Valenzuela or Kirk Gibson. 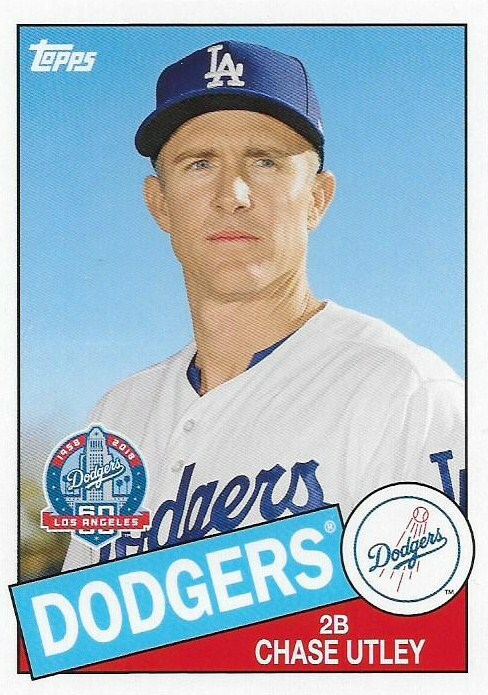 I was really hoping for Orel Hershiser. Instead it's the manager of both the '81 and '88 World Champions, Tommy Lasorda, which I guess is appropriate. 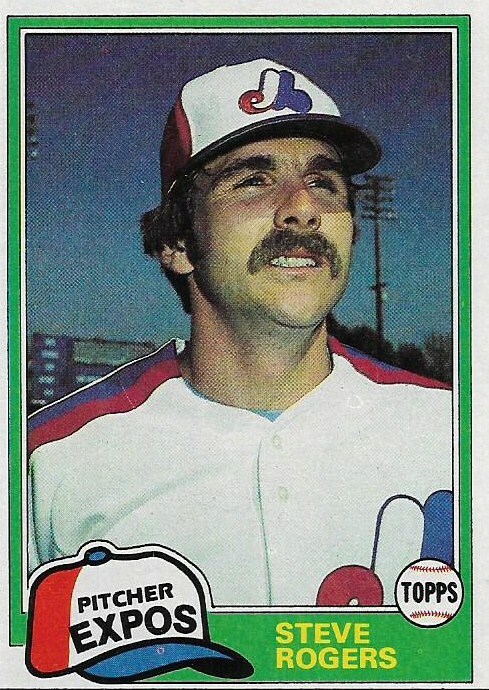 And there were manager cards in the 1985 set. Still isn't The Bulldog though. 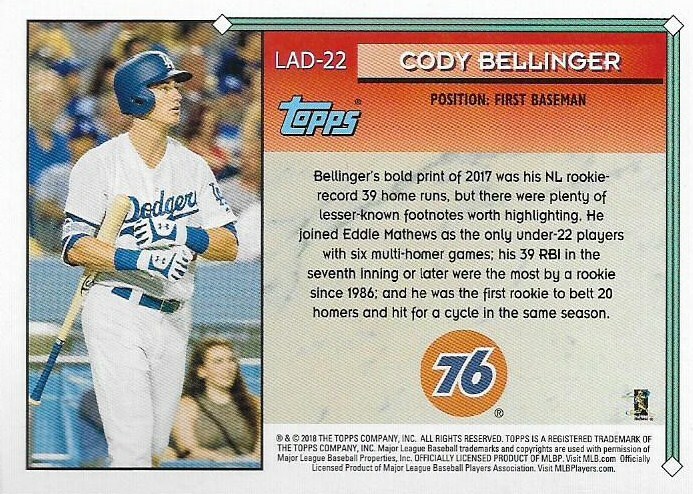 The next set recalls the 1990s. That was a period of great success on an individual level for L.A. As the write-up says, the Dodgers produced five straight rookies of the year and brought Asian players to the major leagues. But the individual success didn't translate to team success and by the end of the '90s there was quite a bit of strife in the front office, which basically lasted until McCourt got the boot. 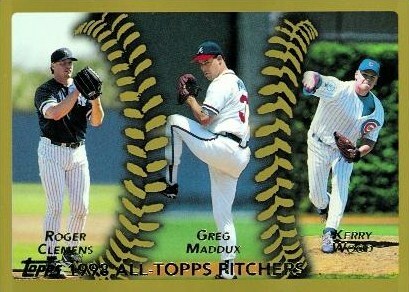 The '90s cards utilize the 1994 design, which is interesting since that was the strike year. But I appreciate the unexpected direction. 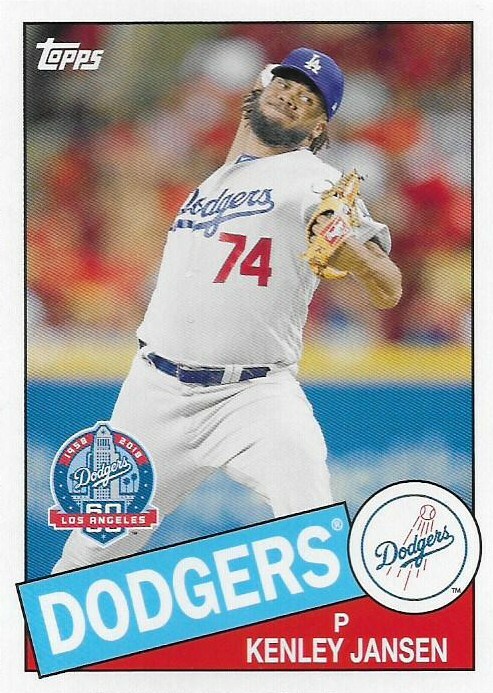 The cards stay true to the photo tastes of the time, which was all action photos. 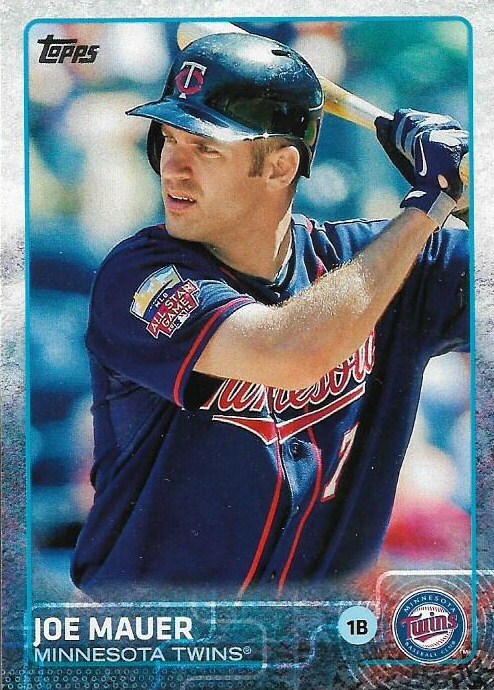 The retro star for this series is who you'd expect it to be, especially with the 1994 design. 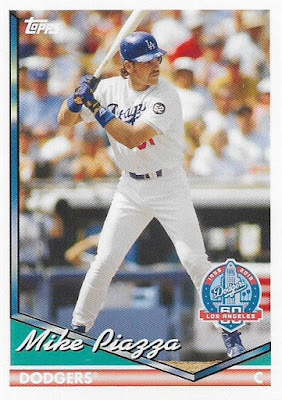 I've seen Piazza on the '94 design so many times and in several different ways, but I appreciate this particular photo as I know it's from 1993 because of the No. 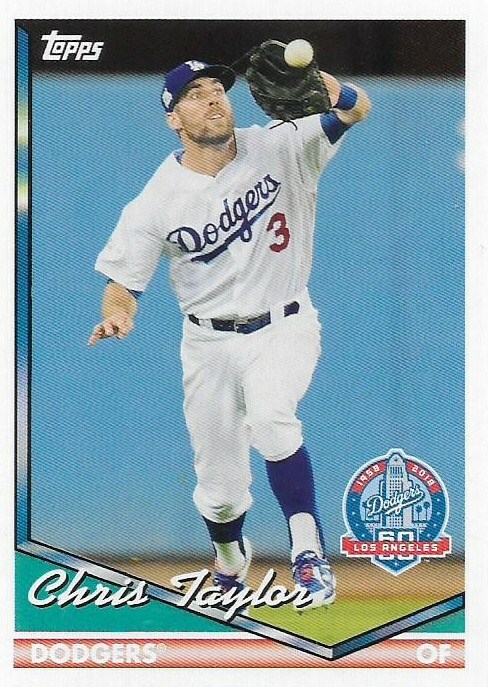 52 on Piazza's jersey that the Dodgers wore in 1993 to memorialize former Dodgers reliever Tim Crews. Here are the backs for each series. The '94 cards feature a different photo than what is on front, which is a nice touch. The '85 backs are appropriately mind-numbingly boring. 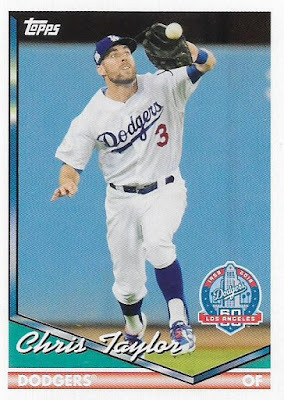 There are two more sets to go in the giveaway as the Dodgers will remember the '00s in August and the '10s in September. I think the '00s set will feature the Topps 2001 design, but I don't know the design for the 2010s. It better not be 2016. Many thanks to Andy for sending these along! I'm jealous. 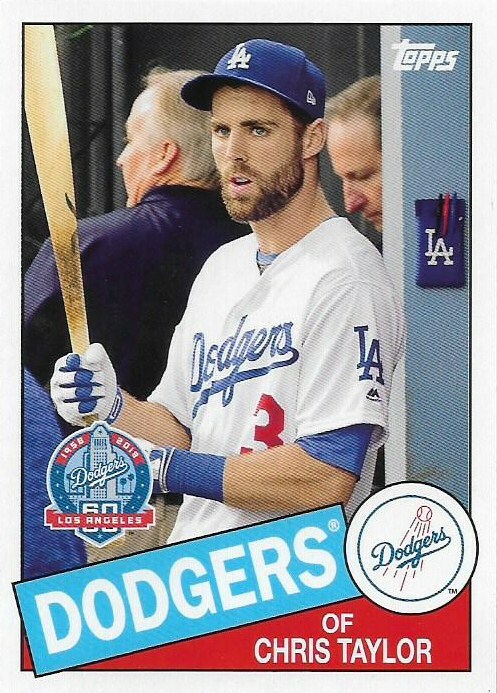 He gets to go to Dodger Stadium AND get cards. I've mentioned a few times -- to the degree that readers probably want me to shut up about it already -- that I am very busy this month. I just finished a week in which I had no days off. On a scheduled day off, I worked nine hours. 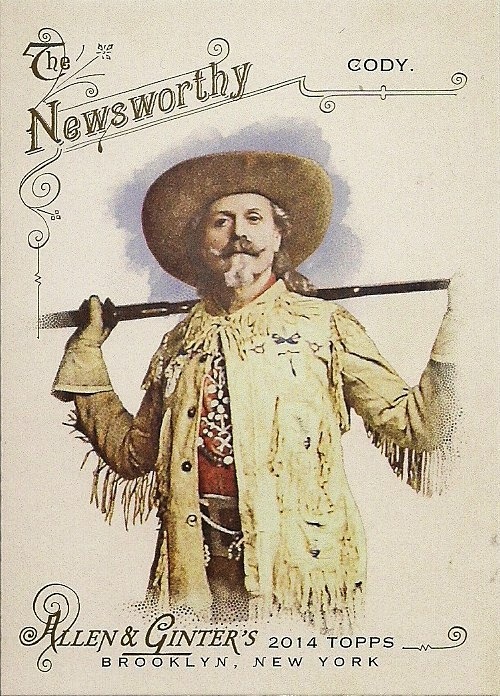 As June reaches its final week, it is apparent that I will have posted on this blog fewer times this month than I have in any other month since I started blogging almost a decade ago. That's just the way June is these days. What was once a light, carefree month full of SCHOOL'S OUT FOR SUMMER is now packed with every kind of busy bee activity, many of which don't fit my job description. It all ends this week. Sure, I will have zero time to blog tomorrow and Wednesday, but after that, I can tell this month to kiss my booty. I am so looking forward to it. I am Almost Done. To celebrate the almost end of the month that is rapidly challenging March for the least relaxing on the entire calendar, I decided to address the Almost Done cards from all of Topps' flagship sets. For example, Drew Smyly is 2018 Topps' Almost Done card. 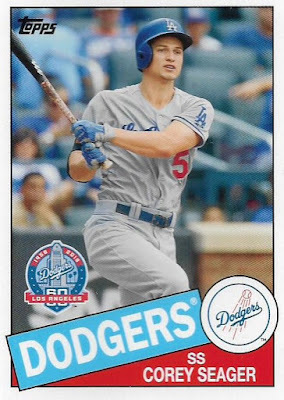 It is the second-to-last card in the 2018 set (to avoid confusion, I'm considering the Update set a separate animal). 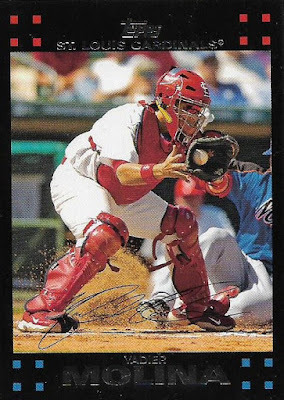 Smyly is card No. 699 and Shohei Ohtani is card No. 700. 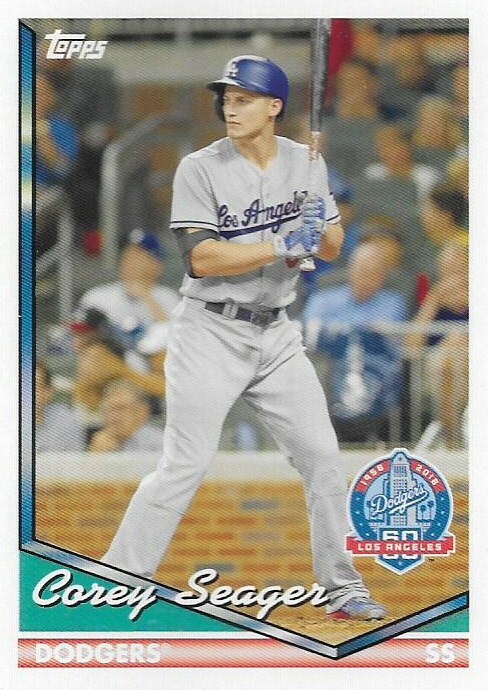 (I will address Topps' current obsession with assigning the hot rookie to the final card in the set later). Smyly is the penultimate card in the set. 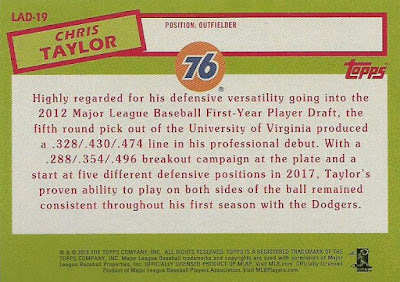 I came up with this post idea one day while noting that Rance Pless -- the topic of last night's post -- was the Almost Done card of the 1956 Topps set. 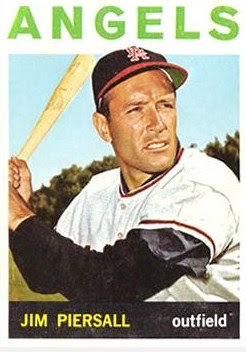 There are 340 cards in the '56 set and Pless is card No. 339. 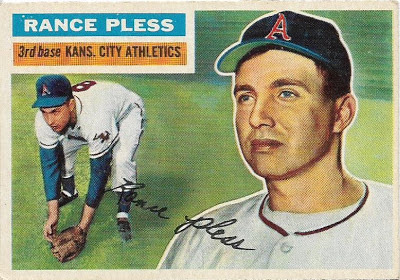 While going through Topps' history of Almost Done cards, those are the types of players that were placed in the next-to-last spot for a long time, forgotten players like Pless. 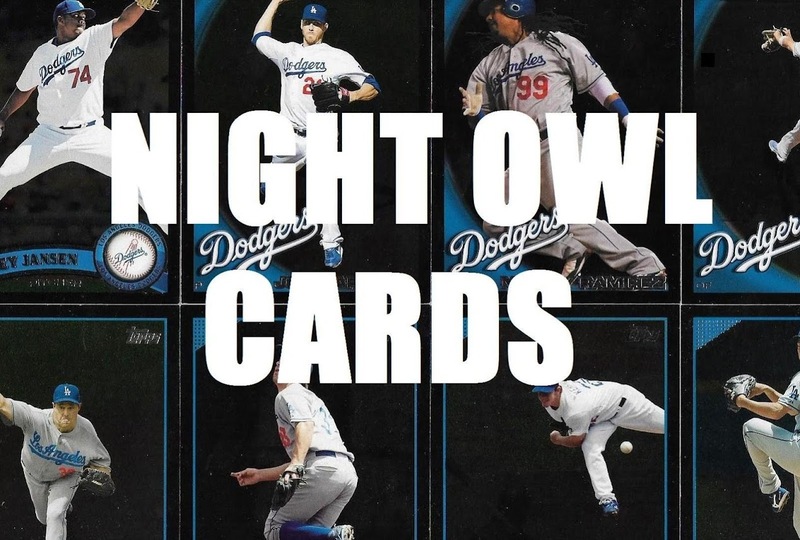 Let's take a look at the Almost Done cards for each year and note how things have changed. 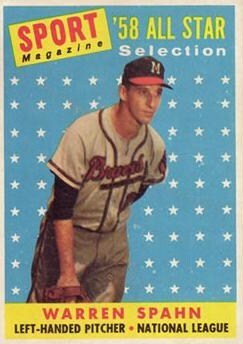 Spahn is the most significant Almost Done card so far as 1958 began a four-year period when Topps ended the set with All-Star selections. 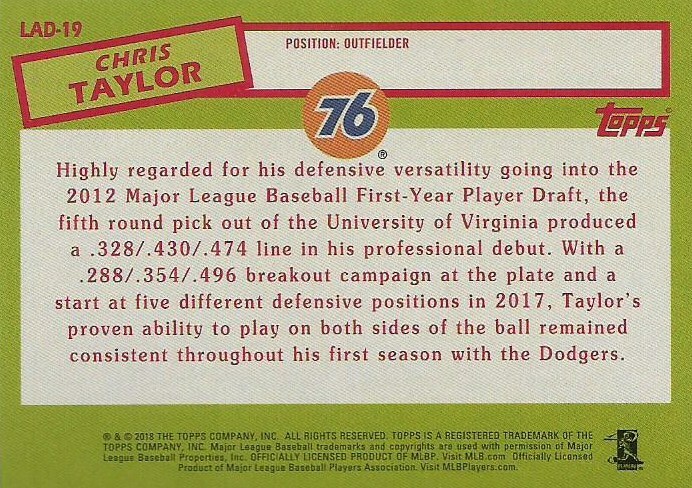 The first checklist to land on the second-to-last card in the set. 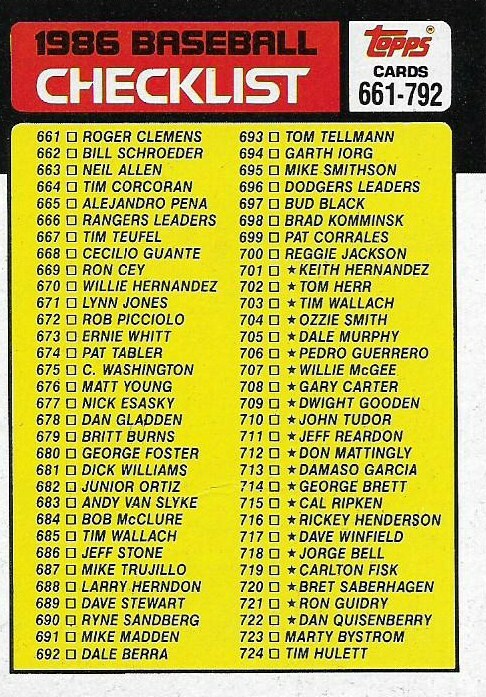 Topps started lumping all of their checklists at the end at this point. 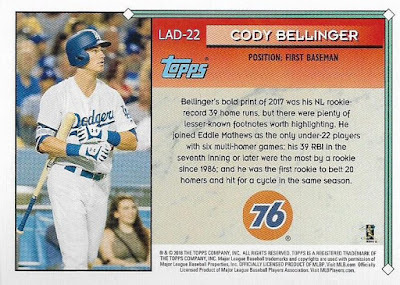 This is also the beginning of the period when Topps started placing something other than an ordinary individual card of a player in the Almost Done spot. 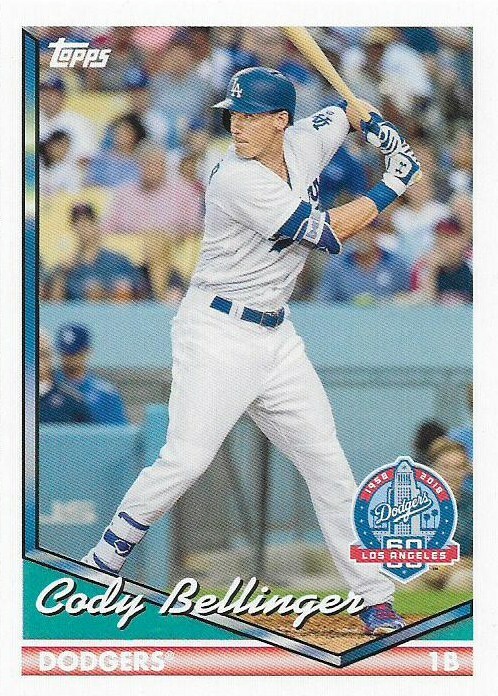 This marks the return of the single-player base card. It's also the first Almost Done card ending in a zero. That is because the set was 661 cards in 2007, I believe because Barry Bonds -- card No. 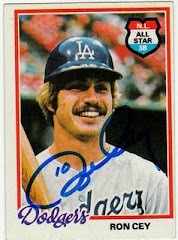 661 -- was a late edition, as he re-signed with Topps just in time to be included. 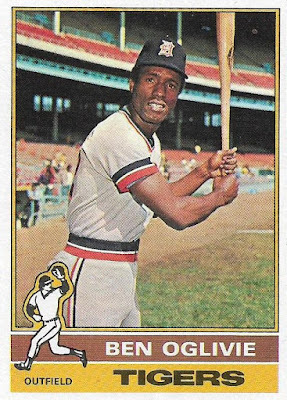 This is when Topps started messing with the back of the set with late-addition short-prints and all the other nonsense that I refuse to chase. 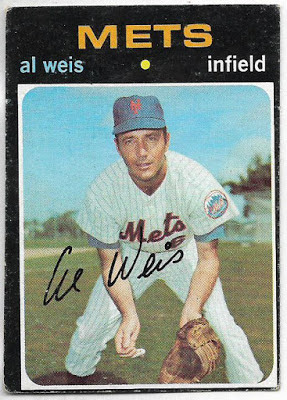 Card No. 661 is the short-printed Johan Santana no-hitter card, which if you believe in such cards would make Molina the Almost Done card in the 2008 set. 2009 Topps just gets better and better. More hijinks. Stephen Strasburg was added as an SP at card #661, which would make McCarthy the Almost Done card. Don't you miss the good old days when there weren't two answers to everything? 2012: Homer Bailey, Reds, #659 OR Yu Darvish, Rangers, #660 (another late edition at #661 as a Bryce Harper SP was created just for the box-breaking junkies). 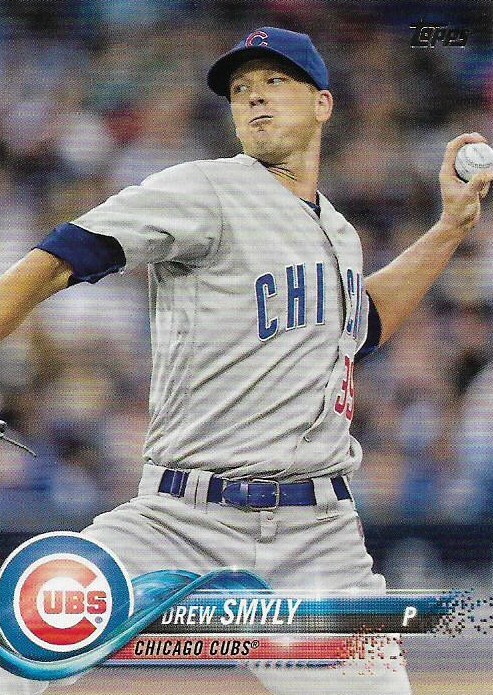 2018: Drew Smyly, Cubs, #699 (There is an SP of Gleyber Torres at #699, but I'm ignoring that). So that is the rundown of Almost Done cards for Topps. As you can see, it got more complicated as we got closer and closer to the present. That's appropriate because the month of June certainly got a lot more complicated in the last five years. I guess you can say that about life in general. 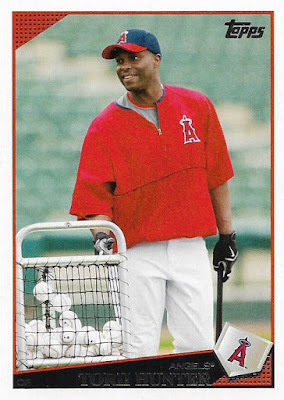 Not even baseball cards can keep things simple.